I really shouldn't bother posting about more vanilla striped socks. There have been so many this year. I've only managed one pair with any kind of pattern on them! But this blog was created as a way for me to document my crafting and socks seem to have become a massive portion of my crafting this year. 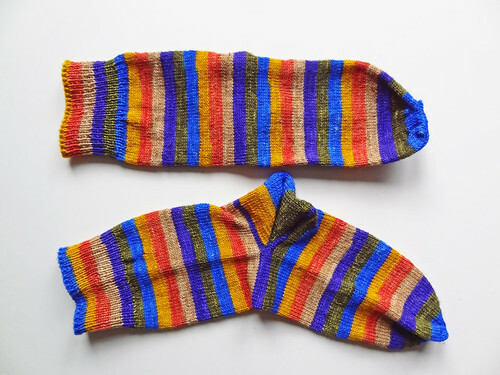 The first pair is made from Knitters Nightmare Boogieman Sock in the Seashore colourway. I cannot begin to describe how happy this colourway makes me. It is vibrant and really does conjure up the shore to me. See, wouldn't they make you happy too? As with all my recent striped socks I used the opposite end of the skein to knit the heel so the stripes didn't get interrupted on the front. It's a bit annoying sometimes when the two ends get twisted up, but it's worth it to get those lovely neat stripes. The other socks I finished are quite ordinary in comparison to the first pair. 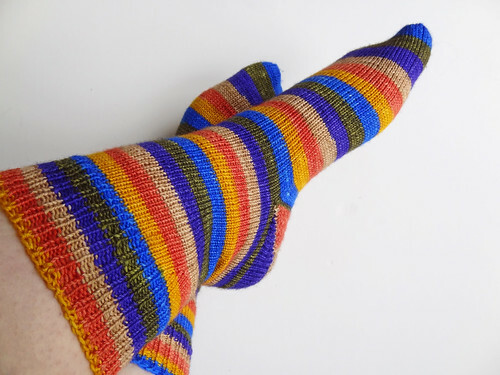 They are knit from Regia and are from the Design Line Ombre Stripe collection. Regia is a great workhorse yarn and their design line colours are usually quite interesting, mine is in the exciting colourway name of 04480. I knit my very first pair of socks out of Regia sock yarn, and they have been machine washed every time since their construction in January 2009. They still look great, with ne'er a pill to be seen! These socks were a bit on an experiment. The first sock (the left) I knit using my usual two sets of fixed circular Red Lace needles from Chiaogoo. These have become my favourite method of knitting socks. 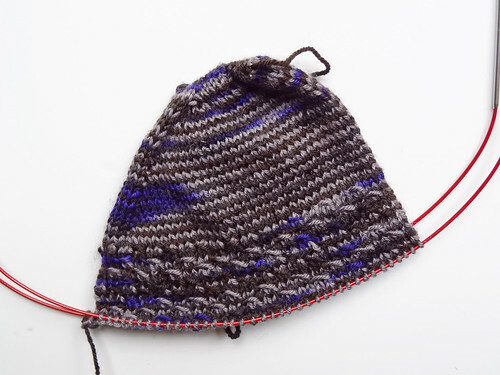 I used to do knit both socks at the same time, but it is much easier to manage one sock and one skein at the same time, than doubling the things you need to manage. I am happy with that sock. However, I decided to do an experiment in my knitting tools on the right hand sock. I used double pointed needles for the first time in a very long age. Not only did I use DPNs, I used KnitPro Cubics Symphonie Rose DPNs. These pretty square needles are very different from my robust and round Chiaogoos! The Cubics are very flexible and it was slightly disconcerting how much they bent with any kind of pressure placed on them. However, though they bent they always snapped back into shape and never broke. The DPNs were as fiddly as I remembered and very annoying at times (usually when I dropped them), but I cannot deny how neat and even the stitches look on the right hand sock. I the above photo, the socks have not been washed or blocked so you can really see the difference. I didn't really enjoy working with the DPNs, but I feel like I need to give it another go to see if I can get my head round them because the stitches really are great. I've just noticed while examining my stitches that the stripes go in the opposite direction on the socks, oops! Never mine, the yarn is still pretty. I have another couple of skeins in the same range waiting to be knit with, but right now I'm working on a pair of socks with a pattern!!!!! Yes, I am knitting in something that isn't striped. The yarn is from FO and Dye and is merino and nylon sock yarn in the Death colourway. I decided to do a texture stitch on these socks, to change things up a little. 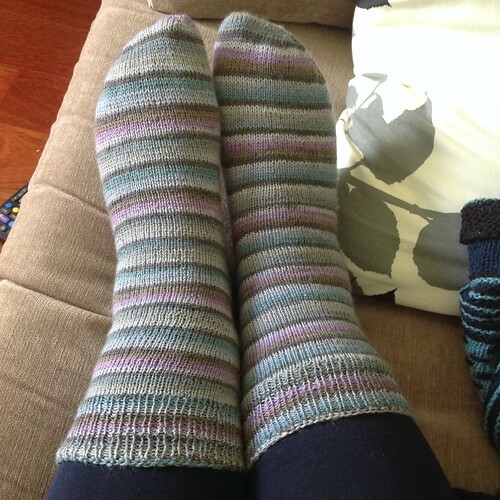 It uses the stitch pattern from Show Off Stranded Socks by Anne Campbell. It's a nice simple stitch pattern that is entertaining but straight forward (my favourite kind of pattern for socks). It's hard to see the texture in a flat photograph, but I can assure you in real life, it looks great. You will be pleased to know that my sock production has slowed a little now I have 11 pairs in my drawer, but I don't think I'll ever stop!